As you’re getting ramped up for holiday sales, you’re likely looking for ways to maximize conversion on your store to make the most of the increased traffic. To do so, reducing your cart abandonment is going to be key: be sure to show shipping rates up front, offer free shipping (at least as an incentive for minimum order values), and be sure your checkout process is well-tested. There is one leading cause of abandonment that you may not know about, though: 26% of consumers abandon a purchase if required to register to check out. Okay, so this should be as simple as allowing guest checkout, right? Well, let’s think longer-term: having customers register is a great way to combat future cart abandonment, as registered customers are more likely to complete purchases, and more likely to purchase multiple times. Registered customers are also more opening to receiving marketing communication from your store. As such, registration is great for your store — you just don’t want it to get in the way of purchasing. 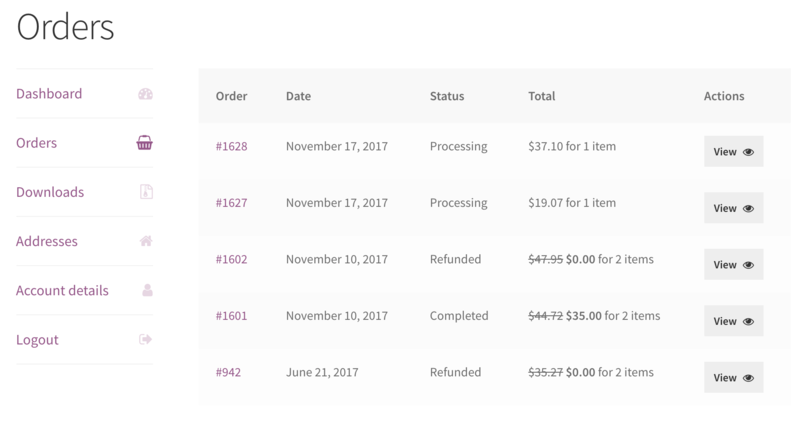 While our Jilt app is focused on recovering abandoned carts, we’ve been thinking a lot about how we can reduce abandonment as well (and how to drive sales from other automations, that’s coming soon ?). Allowing for really simple registration helps you ensure customers can check out as a guest, but register with a click or two after completing a purchase. 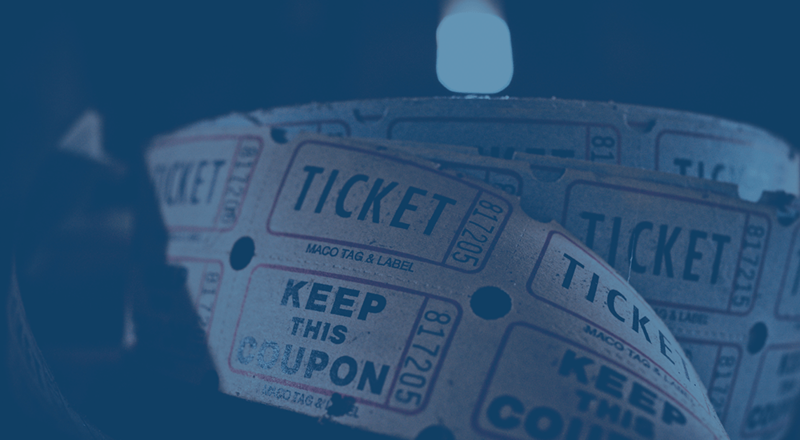 Providing seamless registration is a great way to prevent abandonment in the future and drive repeat purchases. WooCommerce makes this simple by letting you check a box during check out to register. However, for customers who’ve already placed an order, they have no option to create an account after giving you their money. This is a great time to ask them to save their information for later, and to make it easy to register now that they’ve completed their main focus by placing an order. You also have all customer information available still, so it’s pretty simple to save this information to an account. Check out this experience on JC Penney’s, for example. Since Jilt already has a plugin to connect to WooCommerce, and post-checkout registration helps reduce abandonment, we’ve added this feature to Jilt for WooCommerce. You can use this feature without connecting to Jilt — though connecting is free, and will let you track abandonment on your store even if you don’t use Jilt to recover abandoned carts. Even better, you can contact 25 customers completely free each month. 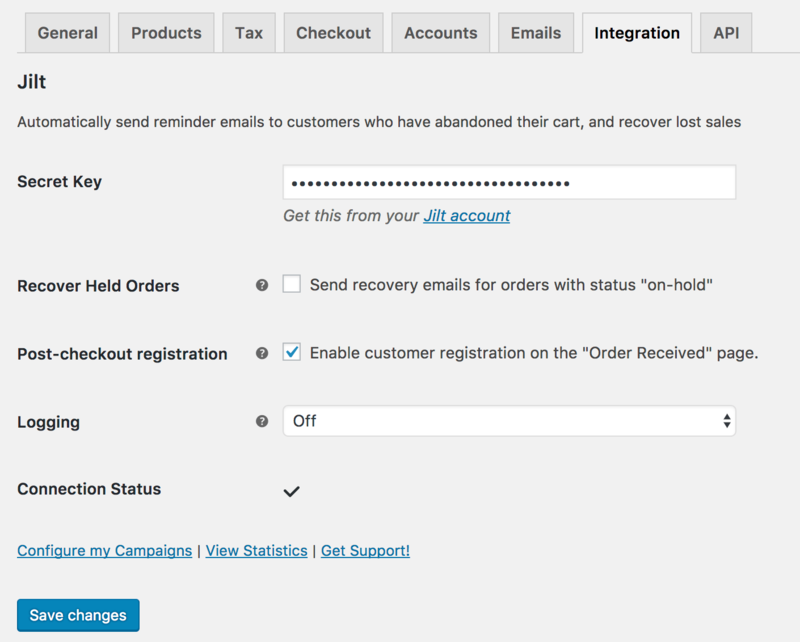 Once Jilt for WooCommerce is installed, you can enable post-checkout registration and start using it immediately. For bonus points, connect to a free Jilt account to get more information on abandonment. This will automatically generate a password and create the new user on your site, logging them in. WooCommerce will then send out the “new account” welcome email, and the newly-registered customer will be directed to the account with a welcome message. All details from the order will be saved, so the billing and shipping address used in the order are available for future orders. Finally, the order that was just placed will be linked to the customer account. As a heads up, only the most recent order is automatically linked to prevent someone from placing an order with another person’s email to access their entire purchase history. What if the billing email is already registered on the site? 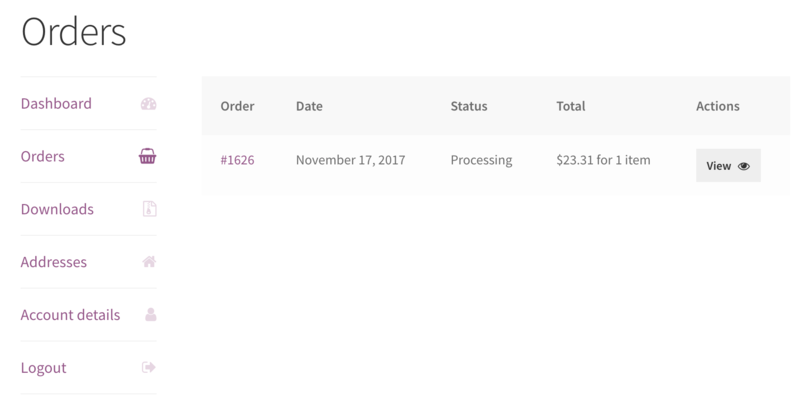 Jilt for WooCommerce won’t prompt your customer to register again; instead, it will ask them to log in to link this order to the account. 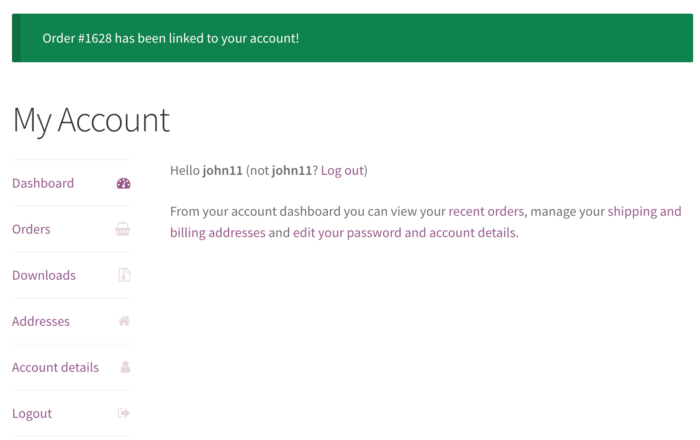 If the customer logs in directly from this link, Jilt for WooCommerce will link orders to the account (since, if this person has the password, we can assume it’s safe to link all orders). That’s a wrap! Jilt for WooCommerce will make it easy for your customers to register with a single click after placing an order, and will save their details for next time to reduce abandonment on future purchases, make it easier for your to market to customers, and increase lifetime value since registered customers are more likely to purchase again. Usually I hate seeing Jilt updates because it means less focus on my beloved Woo Memberships. But this is the first feature that makes me want to install and try Jilt. Glad to hear it! I’d love to know what you think if you give it a whirl 🙂 And fear not, different devs are working on these projects typically, so both Memberships and Jilt always have someone working on them! We’re in a fix release cycle for Memberships now, and starting another feature development cycle for v1.10 soon. My client has the requirement to create 500 users after a purchase. (they are selling access for business to a rewards website where the businesses get 500 user accounts). Do you think that 500 user accounts could be created? Hey David, I would not recommend trying to create 500 accounts at once without a dedicated background handler for this sort of process to avoid issues on the site. I’d have a look at something like Memberships + Teams for Memberships, or I’d recommend reaching out to Wisdm Labs for this sort of project.